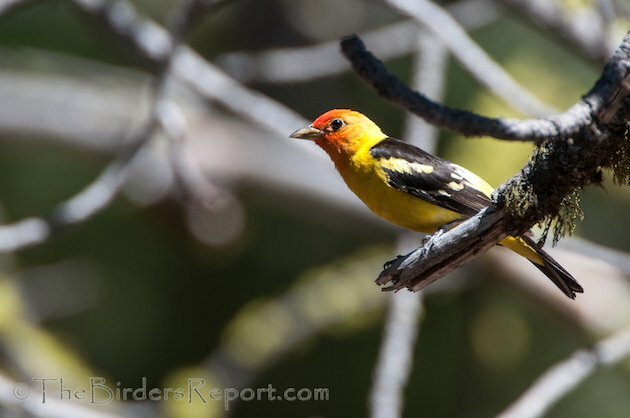 The male Western Tanager (Piranga ludoviciana) is unmistakable. 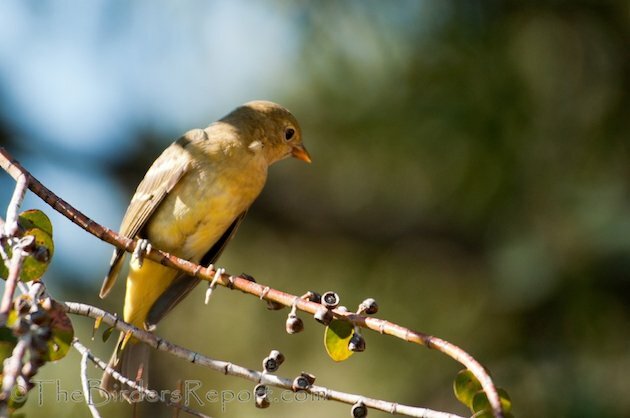 He is the only tanager with strong wing bars, the anterior wing bar (median coverts) being bright yellow. Click on photos for full sized images. The female, this one spotted in my yard last September during fall migration, is a bit tougher to identify. She has kind of an olive-grayish back and scapulars with a greenish-yellow nape and rump. From this photo you can see she has a whitish belly but yellow undertail coverts. They range farther north than any other tanager, arriving in California to breed usually in May. 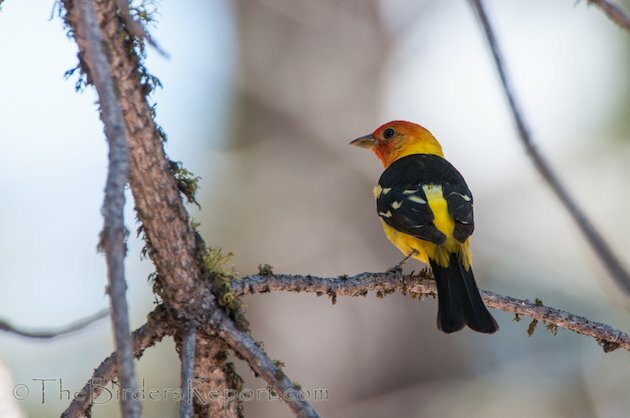 We spotted this male at Lassen Volcanic National Park last weekend where the Western Tanager nests, usually 20 feet or higher in a conifer. Gotta love that flaming red head. And a look from behind. 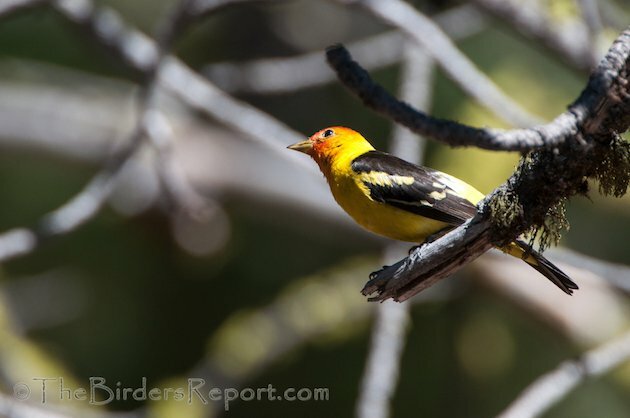 The Western Tanager is only one of over 83 bird species that nest in Lassen Volcanic National Park. You can download their bird list here. I didn’t realize they range so far north. 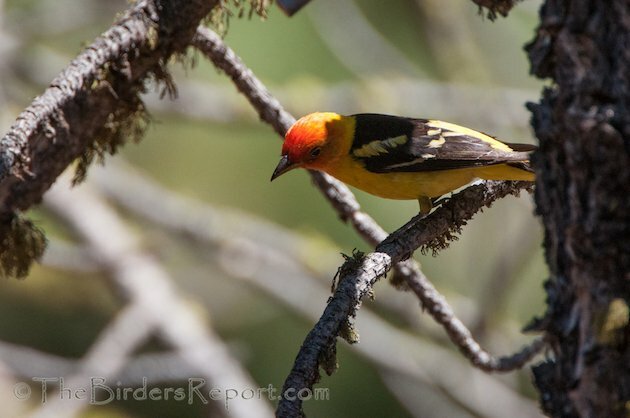 Although we get some in winter on the Pacific coast of Costa Rica, to me, the Western Tanager is like an immediate flashback to doing bird surveys in the pine forests of the Rocky Mountains.